It’s officially the Holiday Season. 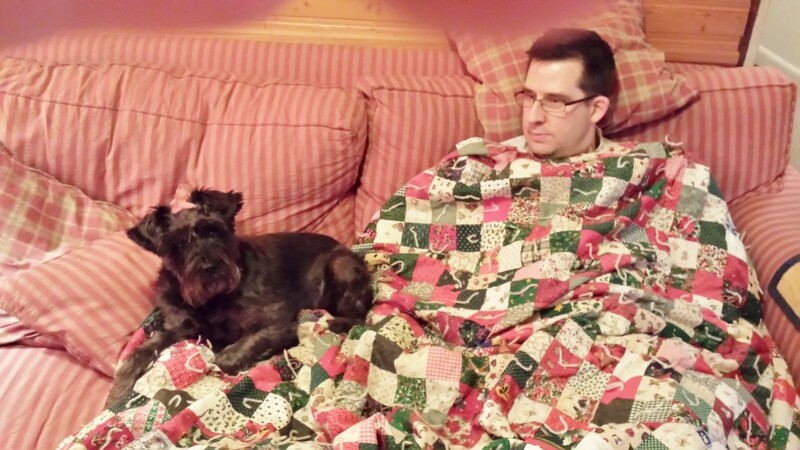 Yep, it’s the famous Christmas quilt. Me and my dad person are breaking it in for the season. Thank you all for being such wonderful caring friends. I hope you all get to snuggle up with your loved ones this weekend. 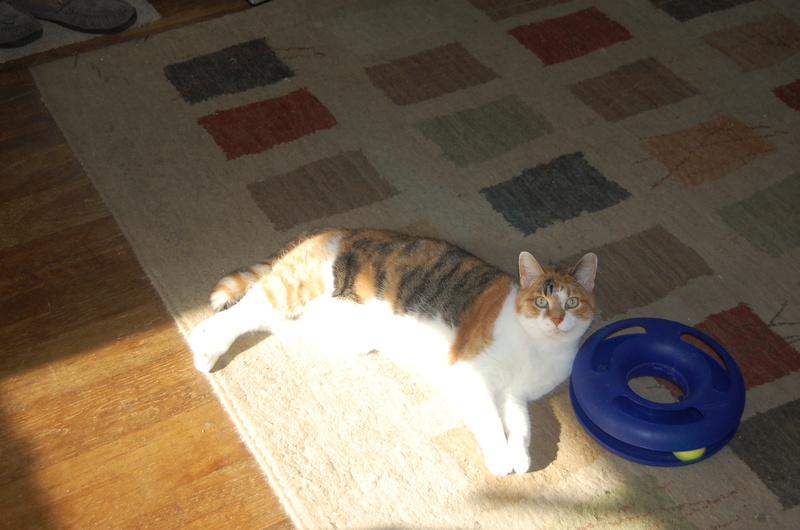 Chloe is enjoying a sunpuddle and her favorite toy in honor of Ginger Jasper who recently passed. *Update* I’m sorry to say that yesterday, Friday, Benny lost his battle. He will be missed terribly. I’m really sorry to have to post this, but more friends are very ill.
Benny has been valiantly fighting his liver cancer with his family and we have all cheered him on. 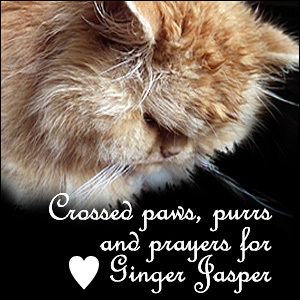 Also the wonderful Ginger Jasper is doing poorly. 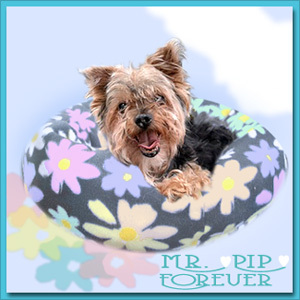 We went to Mr. Pip’s blog this morning & saw his smiling face. My mom person & I were happy to see Pip smiling. Now we have learned that Pip will be crossing his bridge today. His loss will be deeply felt. Madi & her mom have an update here. Head over to Mr. Pip’s Blog to lend your support. Update: Our day just got worse. 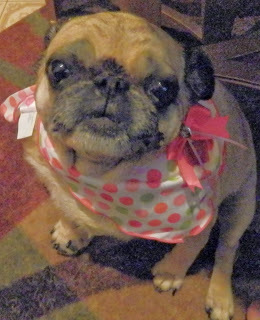 We just learned that dear Gracie Lynn passed suddenly earlier this week. You can visit Gracie Lynn’s family here. Two wonderful friends gone. Everybody in for a group hug, okay? 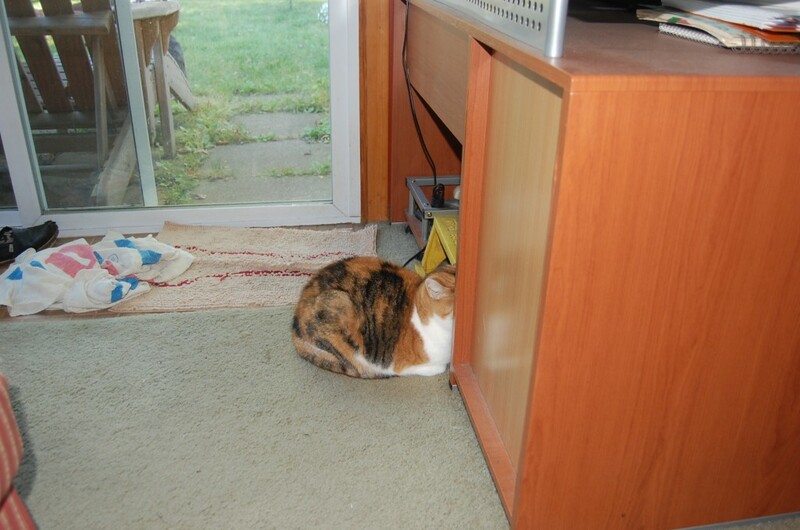 This is Chloe “hiding”. She thinks if she can’t see us, we can’t see her. She’s different. Kitty Caturday ~ Move It! Okay, so while I am back on patrol, working hard day and night to protect this family, look what my people are allowing to happen! 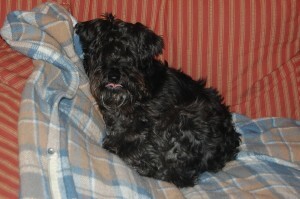 I know, while you clean up that messy corner, get those cats away from my bed & special schnauzer pillow! By the way, that first photo…it’s a before photo. They took me to the groomer last weekend to eliminate my awful odors cut my hair humiliate me by attempting to remove my excessive handsomeness. I’m not emotionally ready to post about that yet! Lady, Just Let Me Do My Job! So I’m starting to get things back to normal around here after being pitiful and sickly. I do my duty by proudly sitting in my yard all day, guarding the perimeter, barking at any passerby and digging the odd hole in the grass when necessary. Part of my resumed routine has not been as pleasing to my lame mom person some people. Sometime between 1-3 AM, often just as I sense my mom person is finally drifting off to sleep, I alert her to the necessity of one final walk around the yard. She tries to let the security slack, but Oskar is back and if a hole needs to be dug at 3 in the morning, then that’s what I’m going to do. I make a lot of sacrifices this way. So after I choose my moment, I leave the bed partially waking both of my people and the 2 cats that share our bed. Once I’ve had a drink and a peek outside, I return to the bedroom to alert them that it is time for me to go out. At first I just walk up the hall and back, letting my clickety-clack claws wake them. Usually doesn’t work. 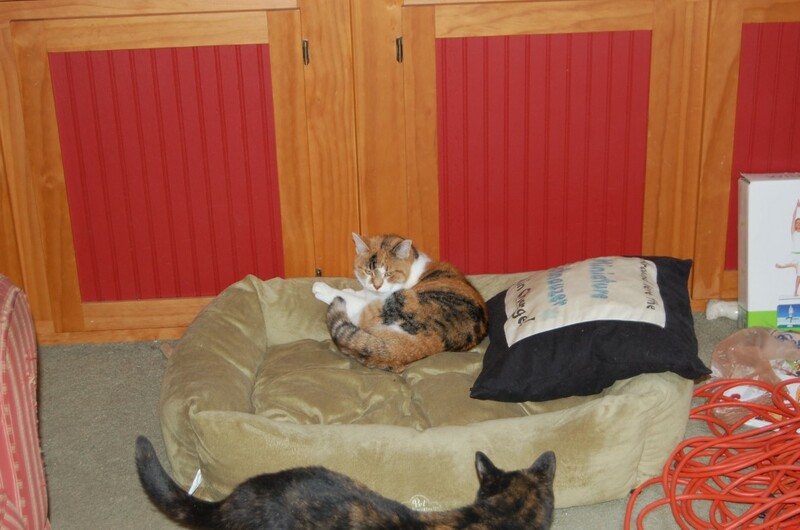 Next I add the jumping up maneuver in which I jump up on the side of the bed shaking it to wake the peeps. Rarely works. Now I get serious by verbalizing my displeasure. 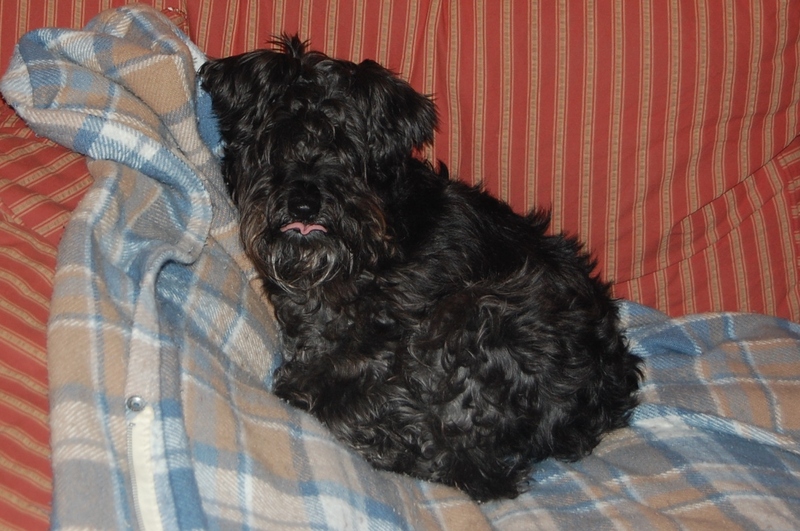 I start with a small whine and lead up to schnauzer sassing speaking. You know, just to get my point across. Once she stumbles out of bed, through the dark house, down the stairs to the back porch and lets me out my real work begins. Guess who stands there shivering in the open door encouraging me to be careless. Just pee and come in she says. 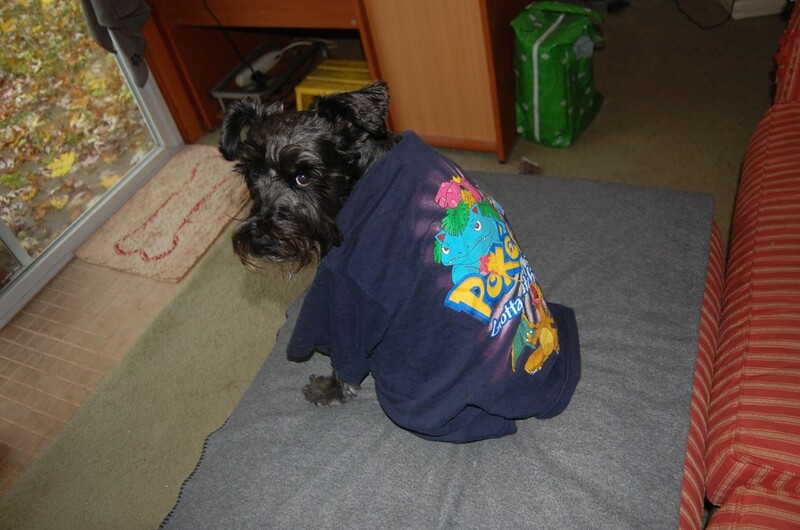 I’m sorry but a schnauzer’s gotta do what a schnauzer’s gotta do. After first making a slow sweep of the entire perimeter, I check any hot spots that I found. Like the scent of a skunk who may need to be chased away, or a toad in dire need of licking. With that out of the way, I like to amble off to the corner where the composting bin is. I find the smell refreshing, but someone gets annoyed because it’s the one place she can’t see from the doorway. Obviously I want her to share in the stink my joy, despite her every effort to thwart my mission. Once she comes out, bare feet in the wet grass, nightgown flailing around in a way that could force some of us into therapy and loud-whispering my name so as not to awake the neighbors, I calculate whether my job is done. 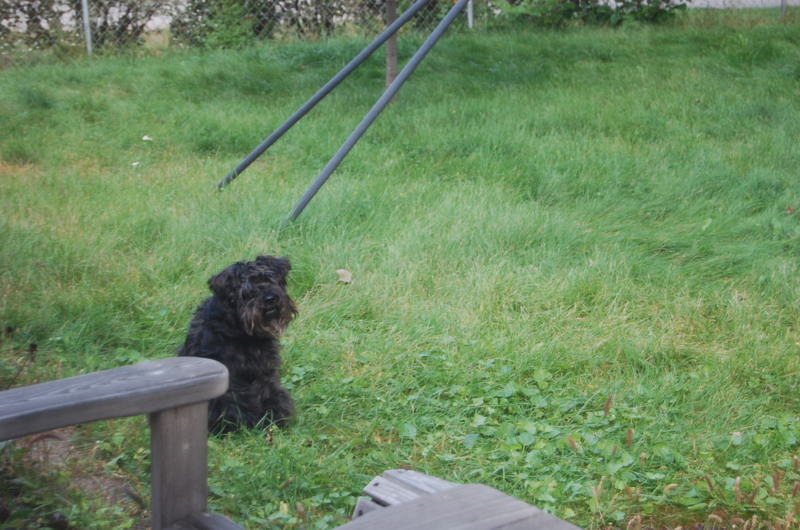 On some occasions part of my responsibility has to include me barking at a shadow somewhere in the distance. It’s in the rule book, nothing I can do about it. Why she has to get so worked up over my verbal middle of the night protection remains unknown. I chalk it up to lack of character. Now it really get annoying friends. When I decide that I can mosey back into the house safely end my mission my mom person expects me to willingly allow not just one, not just two, but all four of my paws to be wiped for mud. I know, you’re saying, “no Oskar, it can’t get worse” but it does. As I make my way through the kitchen and back to the bedroom, I always thoughtfully stop in front of the cookie jar in the kitchen. She’s sleepy, so I don’t mind reminding her that I need to be rewarded for my extensive services and I’m a patient guy. Some where in her crazed, human type mind she informs me that my behavior does not warrant a treat and stumbles back to the bed. 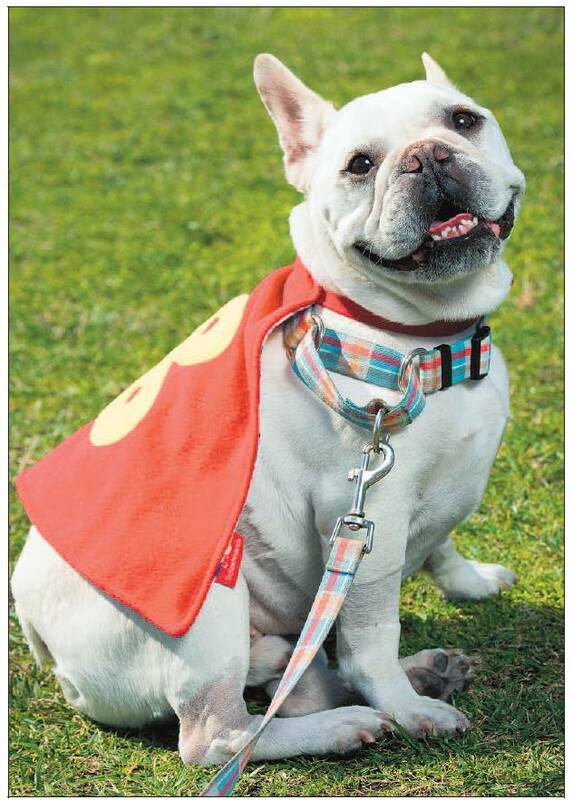 Though this is disheartening, my duty remains the same, protect the premises, dig holes, lick toads and any other dangerous duty that might befall me. Resigned, I will get on the bed, and turn around in about 97 circles, paw at the covers to make a nest, sniff the cat’s butts to make sure nothing has changed since my exit and then fall back asleep. After all the yard needs to be checked again around 6 AM does it not? 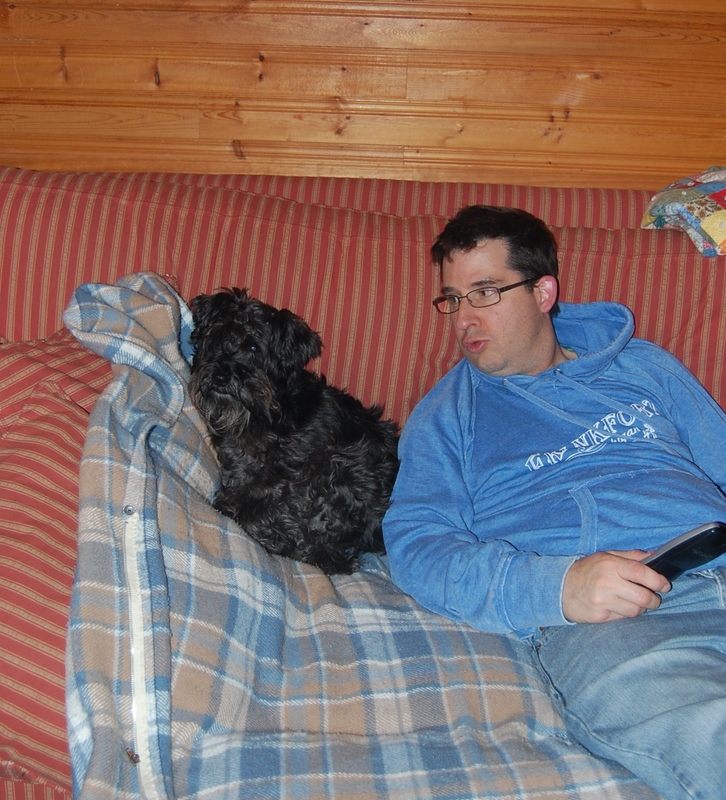 Since we’ve had the sickies, we haven’t had much cool dog stuff to blog about. Today I talked it over with my mom person and we’d like to share an piece about unsung heroes, military wives. Every now and again we probably take time out of our day to think about how tough must be for them. But none of us who haven’t been there can really understand. Ashleigh Baker’s amazing post will help you understand, appreciate and be forever grateful to these American Heroes. How Could I Have Pancreatitis When I Can’t Even Pronounce It? See that big P word up there? That’s what I have. Apparently it’s because I have something called a pane-cree-us. You probably have one too. It made me puke lots. I’m not used to puking and I didn’t like it. This was right on the tail end of recovery from my back thingie that made me have to stay still for 2 weeks! To help my back get better the vet gave me a pill to make me look like Arnold Schwarzenegger called a steroid. 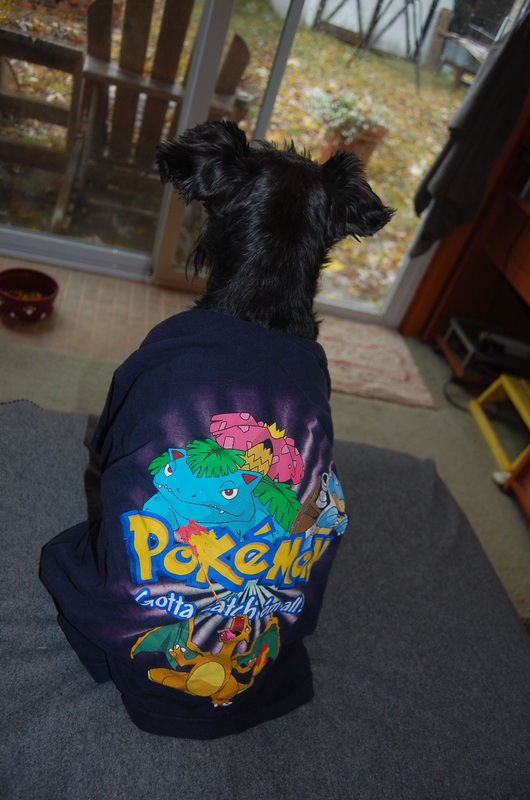 I didn’t get big muscles, but I did get the pukes… Miniature schnauzers are 10-20% more likely to get pancreatitis than other breeds. I guess the steroids helped get the pane-cree-us sick. I’m on a special food from the vet and my mom person talked to her friends at Iams to help determine with my vet the best food for me going forward to keep my innard part from getting sick. I haven’t been able to be groomed for months because of all this. Now you know how much I enjoy working up a big stink in my furs, but I’m getting a little too scuzzy even for me!